Come out and enjoy a night of fun and entertainment on Friday May 17th, as we kick off the Music in the Vineyard Summer Schedule. We will have the Vines Traditionally Blessed by Father Troy, followed by some musical delight with Terry McCauley an Acoustic Pop Guitarist. 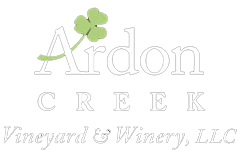 Ardon Creek Vineyard and Winery was founded on a 160 year old Furlong family farm with a rich Irish heritage. We proudly carry on our family traditions of good stewardship of the land and promote a renewal of people working together to produce a quality agricultural product. We offer wines to suit any palate from sweet, semi-sweet, semi-dry and dry in whites, rose, and red varietals. ©2014 Ardon Creek Vineyard & Winery, LLC. All Rights Reserved.